Back to main page for the Music Department. One of the choral workshops at the studio. Early missionaries brought Christianity to Africa. This included Church Music used as a vehicle of spreading the Word of God something that has always made church services lively. The Scottish missionaries worked very hard to teach Malawians singing hymns during church services in order to praise and honour God and to sustain a spiritual life. The Scottish missionaries translated English hymns into the Malawian vernacular languages for easier understanding and singing. The missionaries also introduced music instruction in mission schools. The lessons included the teaching the reading of music notation. As a result, many choir groups emerged, singing nice church music, which has always enabled the congregants to enjoy church services. Most Malawians have become Christians by receiving the Word of God through music. 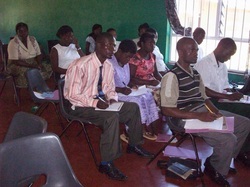 Most Malawian musicians have become self-employed by using the music skills they learned in the CCAP Synod of Blantyre. The self-employment includes live gospel music shows where they get door money collections from the audience attending and appreciating the music show. Others have been busy recording their music compositions on to tapes, cassettes and compact disks for sale. CCAP members have up until now used Church music during funeral ceremonies in order to comfort, give hope to the bereaved and honour God. Church music is also being used during wedding celebrations, church fund raising and counseling sessions. This has been proved to be effective. The Presbyterian Church in Canada helped a lot to boost this church music by assisting the Synod in establishing Synod Music Department. They offered a music consultant named Clara Henderson who worked very well in teaching music and doing administrative work in the entire Synod through the Music Department. They funded four Malawians for University music studies. All four graduated and are now busy working in the Synod. The Synod Music Department now has recording studies, which requires developing it to higher standards, there are many women choirs besides the youth choirs who inspire church members and the rest of people. Women use Church music when they are cheering the sick, conducting public revival evangelism rallies and in turn most of the people submit themselves to Jesus as their Lord and personal Saviour. HIV/AIDS patients have been assisted with helpful messages communicated to them through gospel music done by CCAP Church choir groups. Those who are in leadership position at any organisation have always received counseling, advisory and encouraging messages through church music. They respond positively. The church has lived strongly and powerfully by using the church music as a tool of edification and praising God. The Synod feels that it is important to have this celebration, as we will be remembering the good music work done by the early musical pioneers in the Synod of Blantyre. For the Music Celebration to be a success, an organising committee has been put in place for this event. The activities to take place include choir singing, collages prepared, and awards to those who contributed towards church music growth. We need to provide accommodation, food and transport to some of main key players in the programs during the events. A music cloth has been designed which requires manufacturing for the function. The estimated invited guests who shall be looked after in terms of food and accommodation are about 2300. This big event shall take place at a proposed place called Kamuzu stadium.